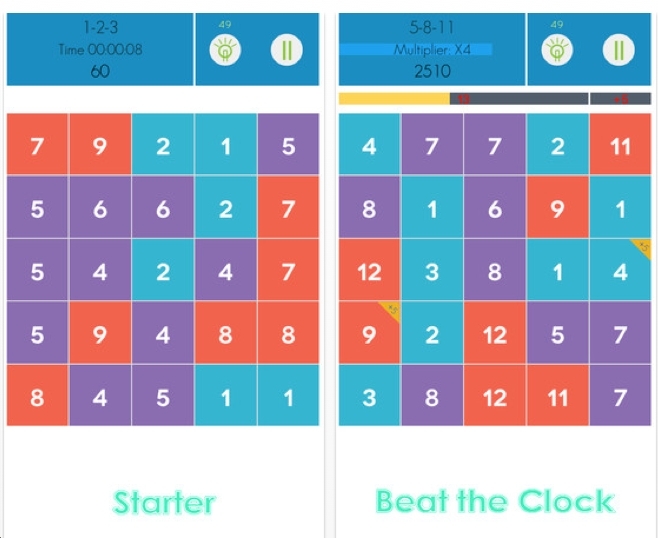 Oliver Klemenz has reproduced Rubik's Clock as a free puzzle app. The object is to get all the clocks pointing to 12. There are 4 wheels on the sides to turn. In addition, there are 4 buttons to push. Also, the puzzle is dual sided. Rubik's Clock is one of my favorite mechanical puzzles - not because it's hard - but because of its unique, clever design. I believe I once saw a Rubik's Clock modification with 16 clock dials on each side. Would love to play with that. Oliver - you've done well! 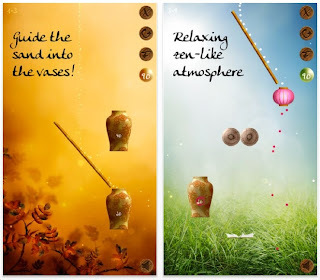 Antti Lehtinen recently contacted me about his physics puzzle app game: 'Zen Sand - The Most Relaxing of the Mind, Logic, and Brain Games.' Quite a long title. You only need to type Zen Sand to find it. Normally, I steer clear of the physics puzzle apps. But since Antti sent me a promo code to play it for free, I gave it a shot. Could not stop! Sand falls down the middle and you must direct it into the vases by drawing ramps. See the pink lantern? When the sand goes through it, it will turn pink and then can be directed into the pink vase. Other features: grinding wheels that make the sand finer. Fans to blow the sand up or sideways. Vases that are upside down. There are 64 levels. I've done 53 and am now stuck. 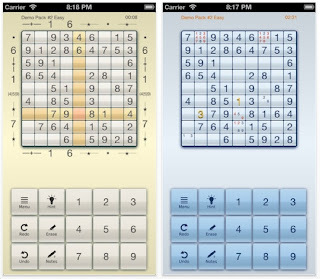 Are you into Sudoku? 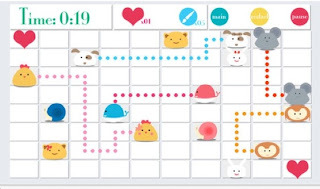 I first started playing it in 2001, when I attended the International Puzzle Party in Japan. A friend guided me to all of the Nikoli Press puzzle books. I was hooked. 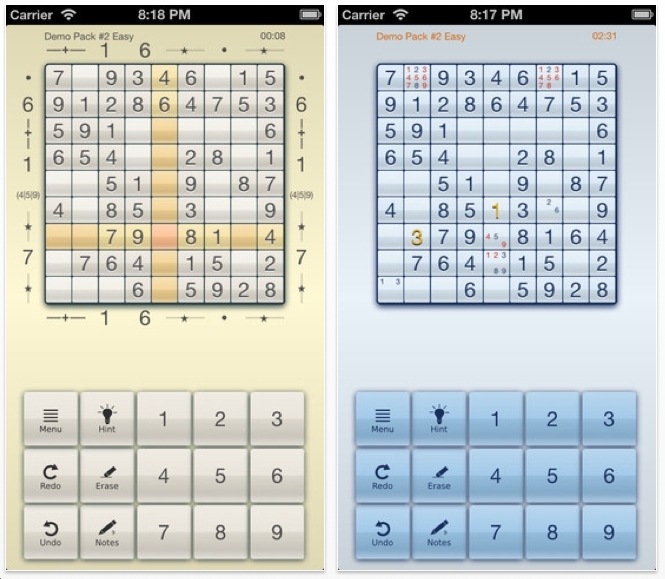 I have since, pretty much, stopped playing Sudoku - even though there are many terrific versions. My favorite is Squiggly Sudoku. SudoCross comes from Shaun Patterson. 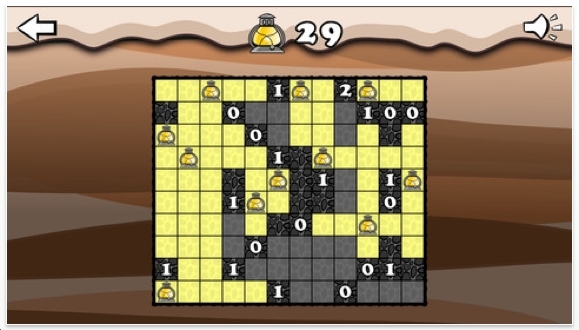 SudoCross is a mixture of Sudoku and Crosswords. Each cell has a clue and the game offers 6 different types of clues when you tap on an empty cell. The clues are: digit, or, range, dot, plus and star. I could go into explaining how they work, but it would be much faster for you to look it up. 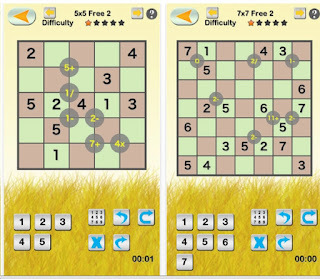 SudoCross is a very serious, sophisticated version of Sudoku. 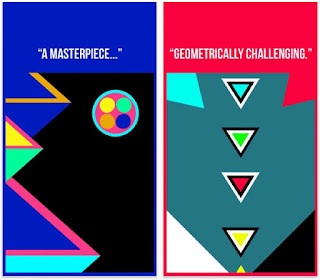 Gravitations is a free puzzle app game. 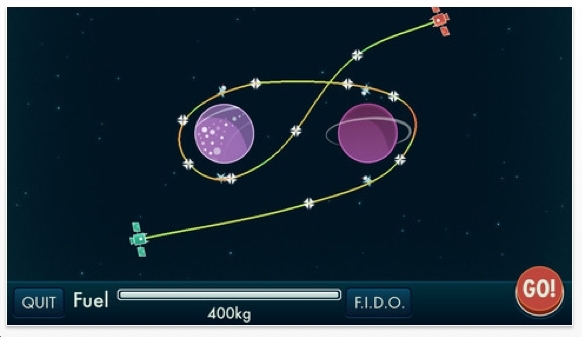 The object is to figure out a flight path that will go from 1 satellite to another, pick up a marooned astronaut and deal with fuel, gravity, black holes, worm holes etc. I did all the Flight School levels. You can set up your own puzzles and post them for others to solve. 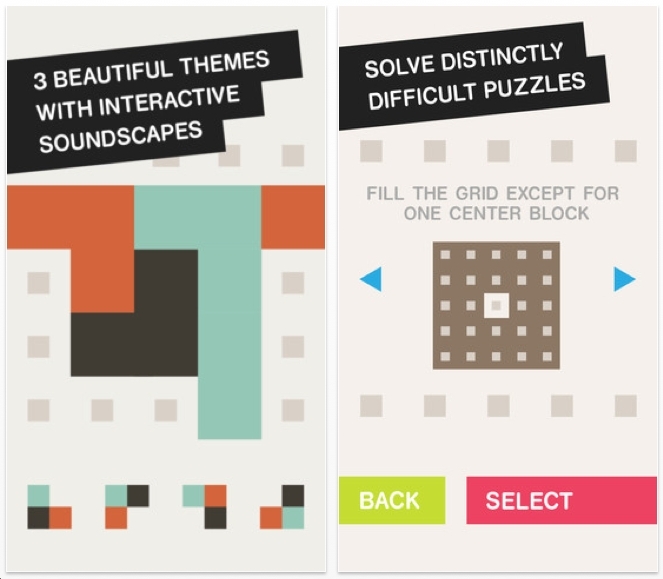 Or, you can solve the puzzles that others have created. Did I mention that Gravitations is free? Very cool puzzle app. 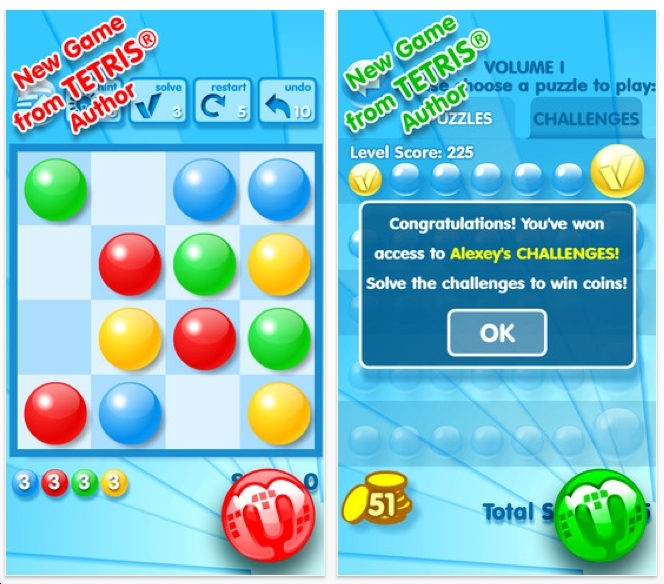 Marbly comes from Andrey Novikov who made Tetris. 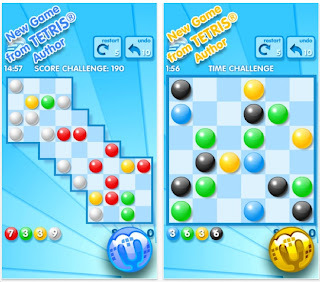 The object is to move balls one at a time to create a row of 3 or more of the same color. 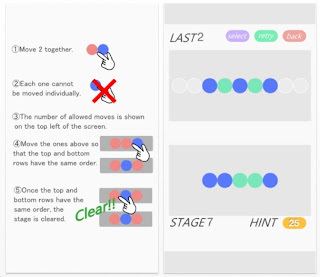 Each move must lead to a set of 3. You win when all the marbles have been eliminated. I've solved all of the levels in volume 1. I think Marbly is quite good. 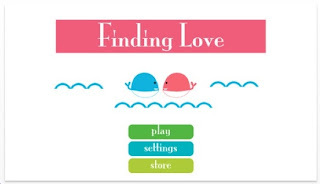 Finding Love is a free puzzle app game from Zhongsong Chen. It is not a dating site. The object is to connect the rabbit to the other rabbit and do the same with the other creatures without crossing lines. I did Chapter One, called 'I love you!' It has 15 levels. I thought some of them were difficult. Chapter 2 is called 'Get Full Version'. http://blog.sina.com.cn/songsapp This is the homepage for Zhongsong. 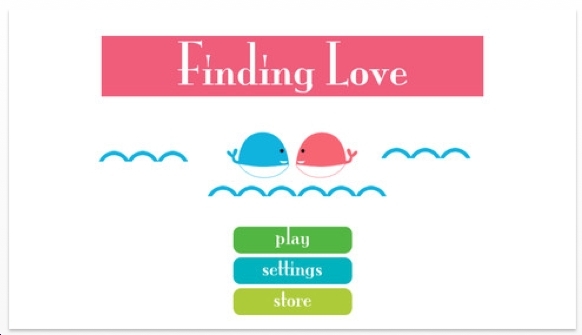 There, he calls the game Making Love. 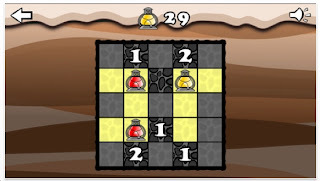 Mathrax is very similar to KenKen. The object is to form a Latin Square: each row will have every number once. Same for the columns. Look at the circle that says 5+ in the first diagram. means that squares which are diagonal will add up to that number. So, in that little 2x2 square will be 4&1 on one diagonal and 3 & 2 on the other. Look at the second diagram at the top left corner. The zero is really the letter O. Which means that all 4 numbers will be odd. 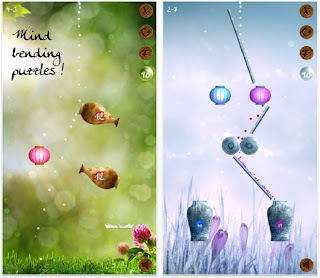 Recently I reviewed another game from Stanley Lam: Ripple Effect. 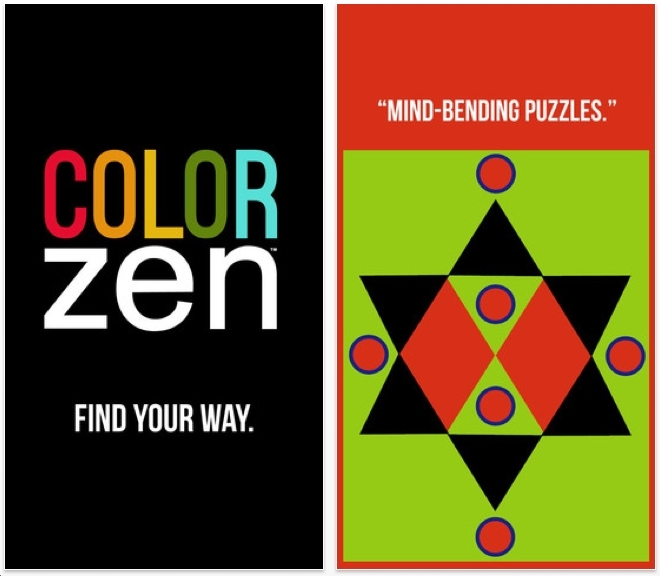 Both of these are rock solid puzzle apps. 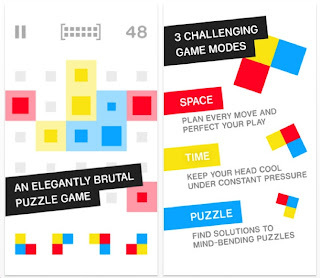 Move Dots is a free puzzle app game. 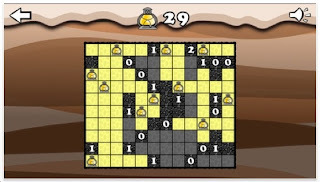 It's classic in the sense that these types of puzzles have been posed for many years. The directions are pretty simple. 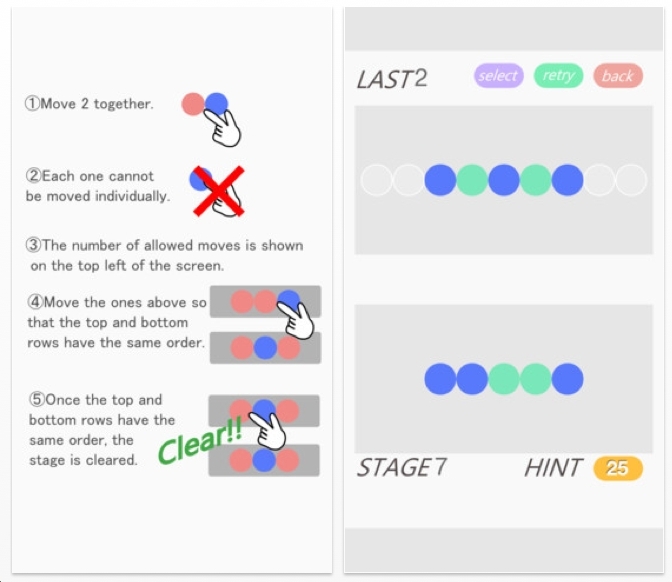 Grab 2 adjacent dots and move them to an empty space. Then grab 2 more adjacent dots and keep doing this until the arrangement matches the image at the bottom. There are 60 levels. I've done 15. 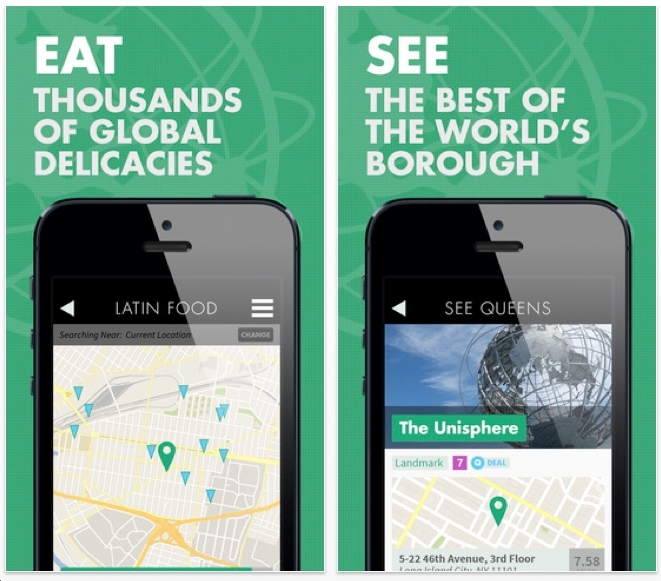 Did I mention that Move Dots is free? 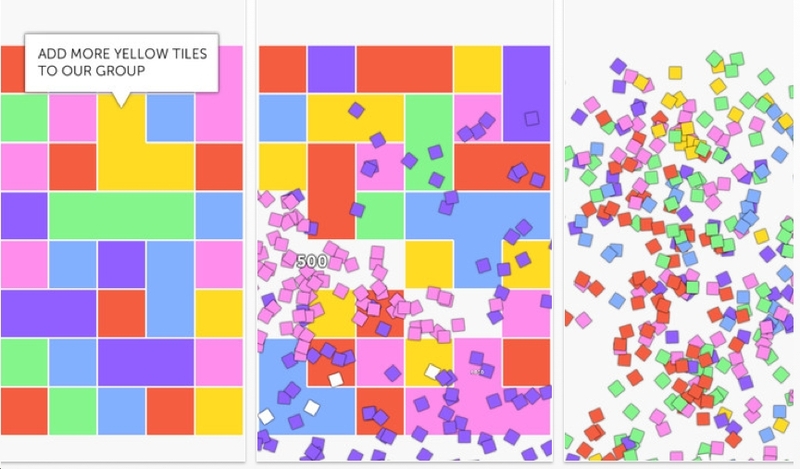 90Blox is a shooting game. 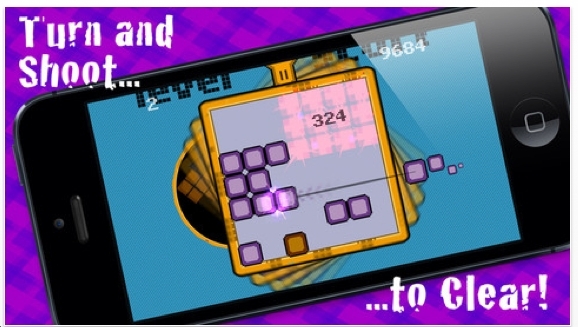 Shoot blocks into the grid from the right side, to form 3x3 squares or other rectangles. You can move your gun up and down - just on the right side of the grid. Tap with your left finger to rotate the grid. 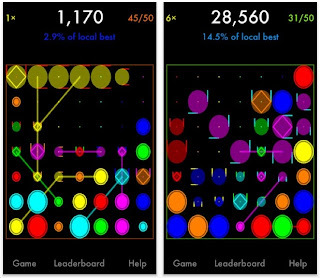 Compulsive is a very popular point scoring puzzle app. At this moment it has 119 5 star ratings and only 5 ratings lower than that. Impressive. 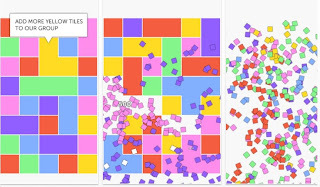 The object is to swap tiles anywhere on the board to create groups of 4 or more of the same color. They will disintegrate and score you points. Naturally, everything falls down and the results could lead to more groups of 4, thus setting off a chain reaction. My top score is 140,900. This puts me somewhere in the top 15% according to the Leaderboard. The top scorer has 284,300. Not sure what his strategy is. I like Compulsive, but I'm not feeling the addiction. 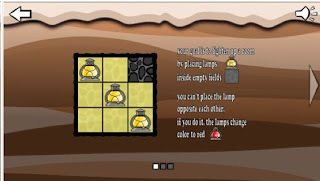 LightenUp is a free puzzle app from Dariusz Morawiec. No idea how to pronounce his name. Look at the first image to get the rules. 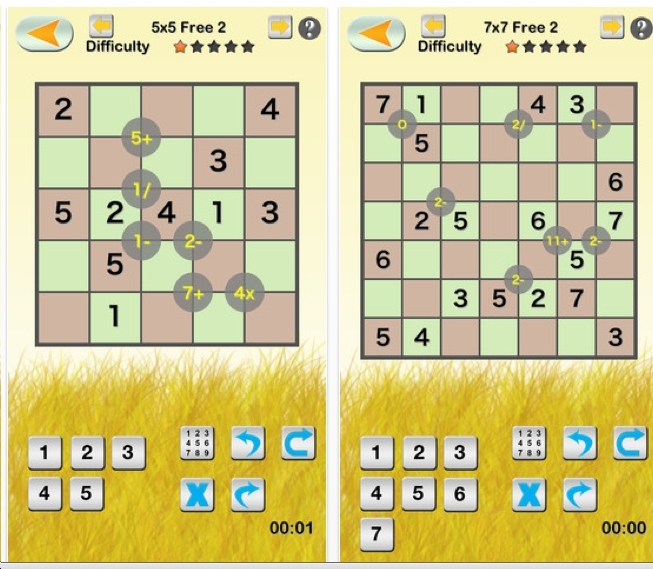 The first 40 puzzles are free. They are the size of the 2nd image. I did them in about 15 minutes. 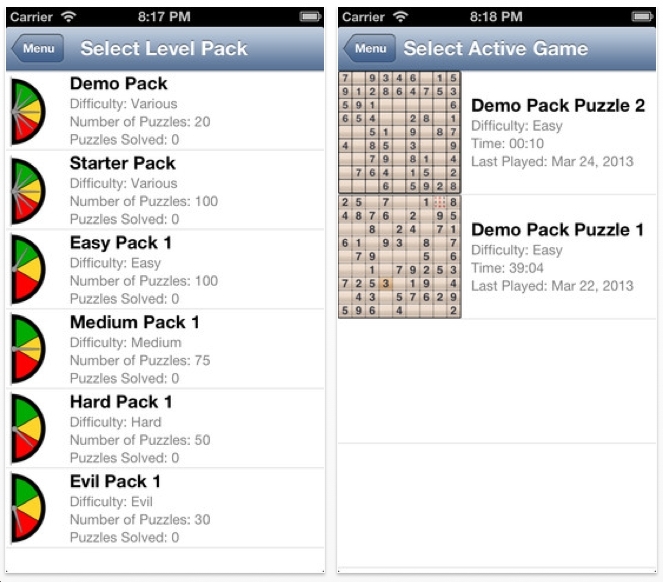 The small grid sizes are perfect for people new to the genre. The next 100 puzzles you have to pay for. They're bigger. I've been doing this type of puzzle for years. Another name is Lighthouses. The best version is Akari 3D which takes this concept to a cube mode. Are you good with sequences? 1, 3, 5 or 1, 5, 9? How about 2, 5, 8? . 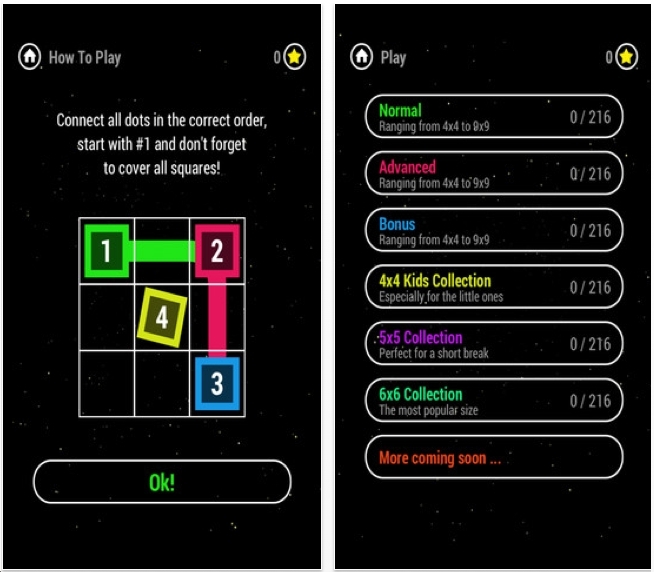 Swipe sequences to score points. You can also swipe four 7's if they're next to each other. I've played this game for just over an hour (not all at once) and scored 115,000 or so. The game is still going on because I'm not stuck. I should mention: when you swipe a sequence, it will disappear and new numbers will fall down. 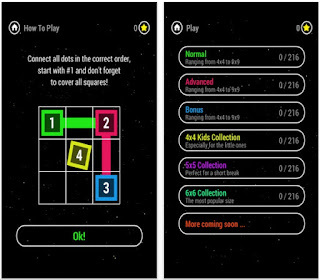 'Double View - The Hardest Brain Teaser Game' is not the hardest anything. But it is challenging and fun. You are given 2 mazes side by side. Swipe your man in any direction, keeping an eye on both at the same time to avoid the walls and pick up keys and then to reach the green target. 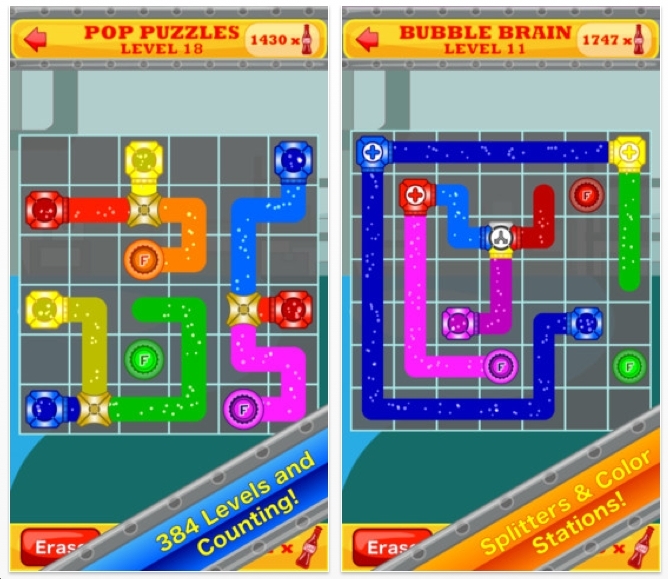 Double View - The Hardest Brain Teaser Game has 45 levels. I've done the first 25. 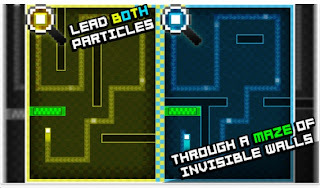 The third set has portals - I haven't been able to unlock that section yet. I really like this concept. I'd like to have the ability to adjust the speed slower for my advanced age. Now for the annoying part: every time you complete a level or fail, you are given an ad. 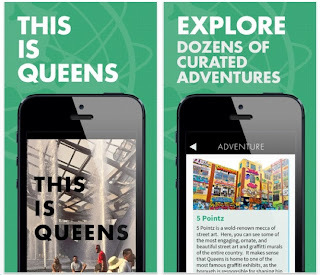 THIS IS QUEENS, is a free puzzle app that highlights the best of Queens: the restaurants, museums, parks etc. Want to visit the Steinway Piano factory? It's got all the details. Did I mention that the app is free? 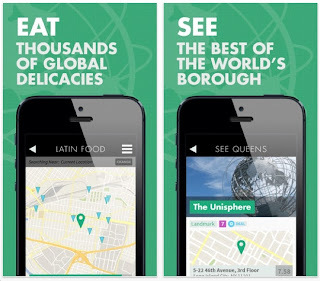 If you're thinking of moving to NYC, Queens is the best bargain. 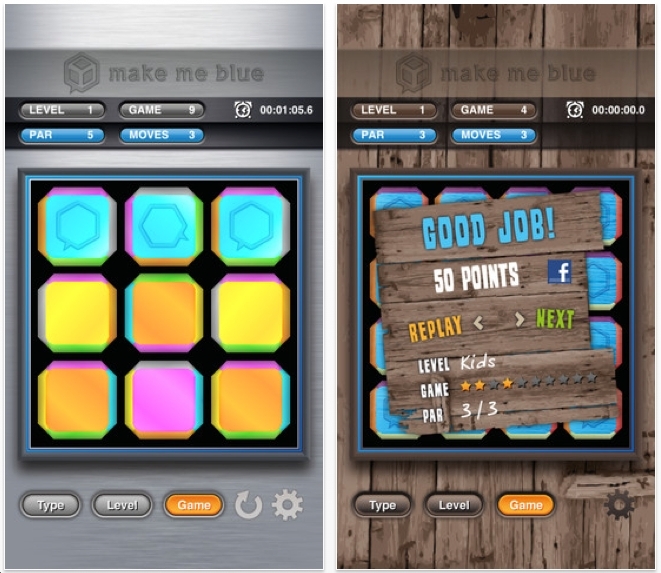 Freek Sanders recently contacted me about his puzzle app game Color Me Blue. 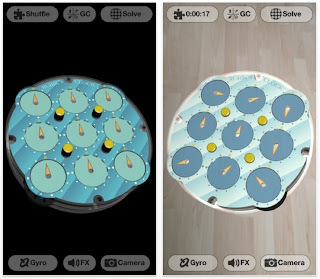 The object is to roll the pieces so that the top is blue. You do this by swiping a column or row. They all move at once. There are 90 levels. I've done the first 22 which fall under the categories: Kids, Beginner and Easy. The next batch are: Medium, Hard, Very Hard, Expert, Crazy and Impossible. There are 2 other modes; I have not tested them. 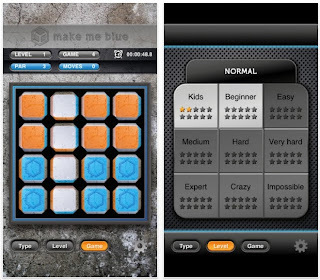 When I first played Make Me Blue, my initial thought was: reminds me of Head Spin, another puzzle app that I reviewed June 9, 2011. Head Spin was just a 2x2 grid and the objective was to get the head face forward, right side up. Damn good puzzle game. Unfortunately, it's no longer available on the App Store. 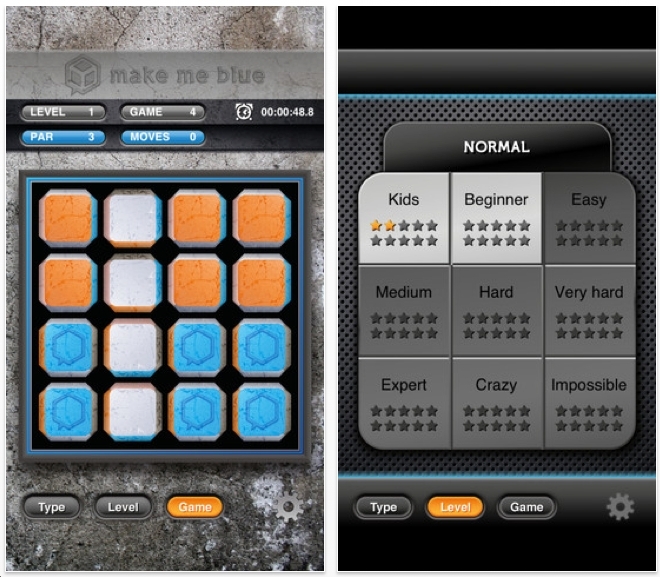 And that's okay, because Make Me Blue is essentially the same, but with more features. 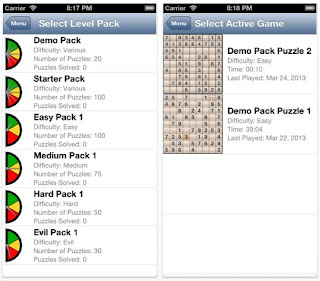 Puzzle App fans: this blog is about to get its 350,000th visit. If it's you, take a screen shot, then send it to me to get a prize. Make sure you send me your mailing address. 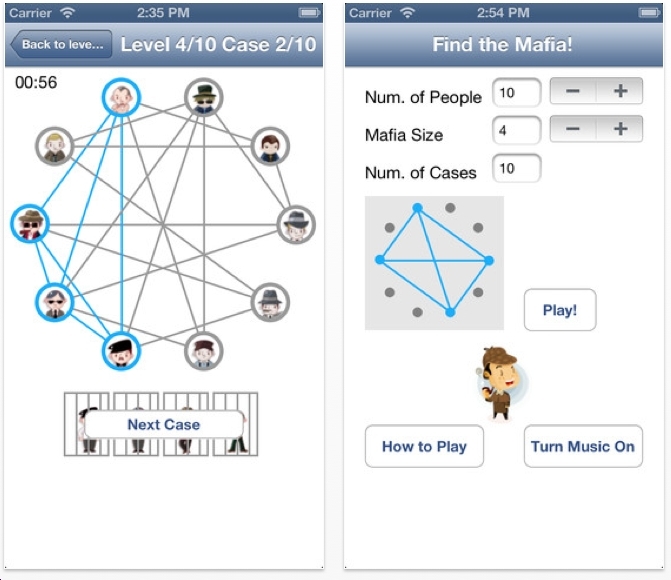 Adam Nagy recently contacted me about his new puzzle game app called Find The Mafia! I wasn't sure exactly how it worked. I set the Mafia Size to 3 and then realized that I was essentially looking for a triangle - that is, the 3 people who all knew each other. Other people might know 1 or 2 of them but not all 3. Look at the first diagram, can you see how the 4 people know each other and their lines equal/correspond to the rectangle with diagonals? Look at the second diagram. There are 16 people and 6 of them are 'made men'. I've tapped on 4 people. 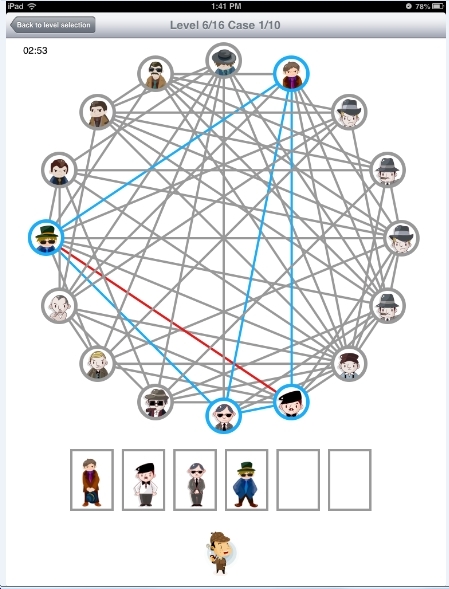 Their connections are highlighted in blue. See the red line? Those 2 people do not know each other. As you can see finding the 6 mafia men is very difficult. In terms of originality, Find The Mafia! seems pretty unique. In terms of playing this game, I think it needs more pizzazz. More graphics would help. There was a game I reviewed not too long ago called Nun Attack. I didn't like that game, but I loved the title and images of nuns with guns and eye patches. That's what I think this game needs. Something outrageous. 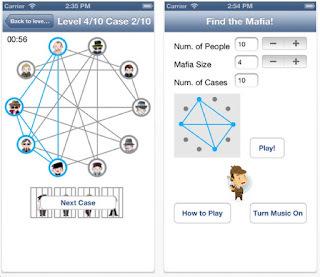 Attention math teachers: show this game to your students! One more thing: I highly recommend the Mario Puzo novel The Godfather. 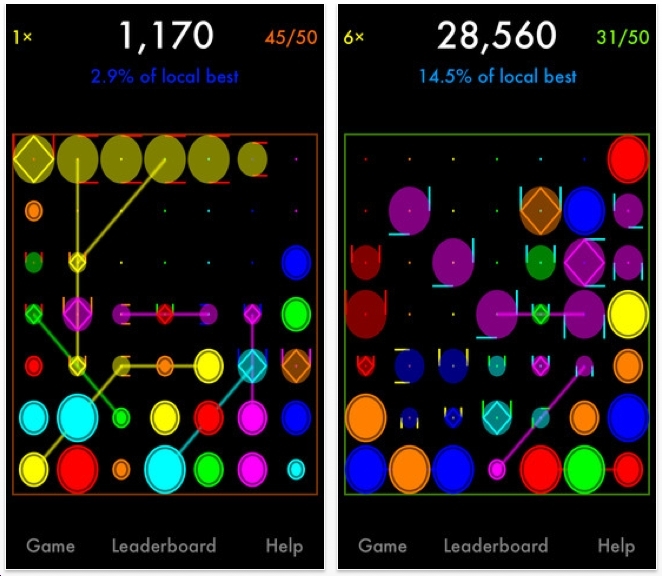 Amir Michail recently contacted me about his new point scoring puzzle app: Chainphoria. The rules/objectives are not stated. They are for you to figure out. Like Vaccine Case and Deadlocked. Chainphoria seems very similar to DropZap and DropZap 2. If you are fans of those, then I think this is up your alley. Personally, I'm not a fan of DropZap, but I know lots of folks love them. Chainphoria is a bit different. After playing it a few times and succeeding - I'm still not sure how or why I succeeded. I think the graphics are very cool. 7/22/14 update: Amir just contacted me about the rules. Cannot simplify them, so here they are! Tap a column to make a move. All pieces in the selected column will become activated. An activated piece will attempt to activate a match with an adjacent piece based on color. A targeted piece has two colors, one for matching, and another to indicate the column to which it wants to move. As a chain reaction proceeds, additional activation steps may occur. A piece that just moved in a particular direction will be activated if the piece in front of it along that direction did not also just move in that direction. A piece may be involved in more than one match in which case it will want to move to the column closest to it that contains an activated piece in one or more of those matches. Learn 2 introduces recolored and created pieces. A match may skip over a piece or a gap but not both. Activating a match that skips over a piece will recolor the piece to the color of the match. Activating a match that skips over a gap will create large circle(s) of the match color. Learn 3 introduces piece following. A targeted piece may at times follow an adjacent targeted piece provided that they are of the same color and want to go to the same column. When a targeted piece is acting as a follower, it is shown without a diamond. 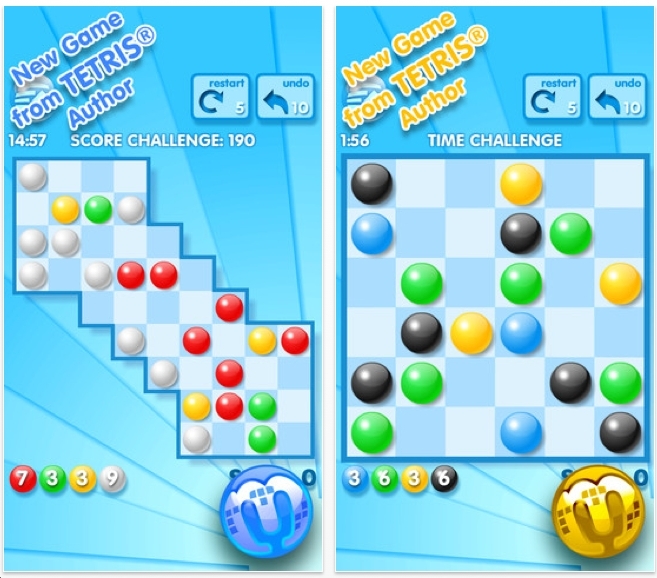 When you destroy (at least) 50 pieces, you will get a bonus based on the number of free slots in the grid after the chain reaction completes, all remaining pieces will be removed, the multiplier will be incremented, a new row will be inserted. When you destroy (at least) 50 pieces, the multiplier will be incremented after the chain reaction completes but there will be no bonus and no pieces will be taken off the grid before a new row is inserted. Two heads are better than one! Try any of the single player learn/game modes in a cooperative two player mode! Several of this blog's followers urged me to look at Stickets by Harry Lee. Look at the first image on the left. Your task is to place those 4 little pieces, one at a time, onto the grid to form regions which have 3 or more squares of the same color. When that happens, tap it to make it disappear. This is not how to score points! You score 1 point for every shape that you fit inside. That's it. When you can't fit another piece onto the board, you lose. I'm extremely impressed with Stickets. Simple, fun, deep, frustrating. My high score is 137. And yet, I've also had very low scores of 15. What I've just described is the Space mode. It's the most fun. The Time mode is okay, but not my thing. 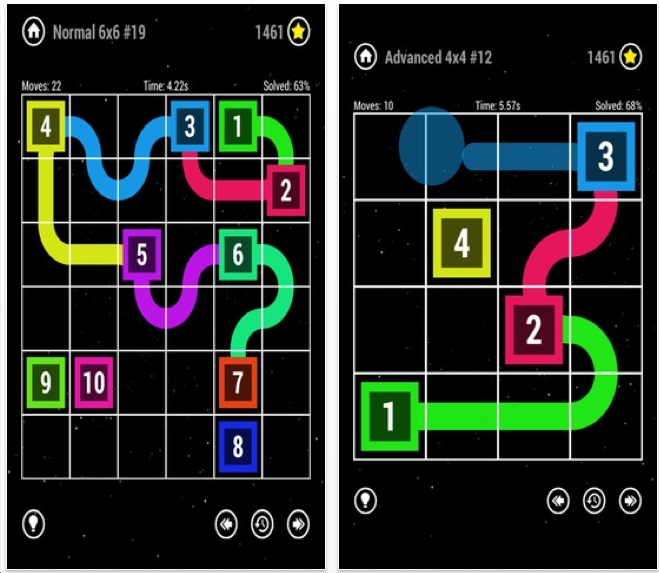 The Puzzle mode consists of some 8 or 9 very different puzzles - related to the Space mode. I've done half of them. 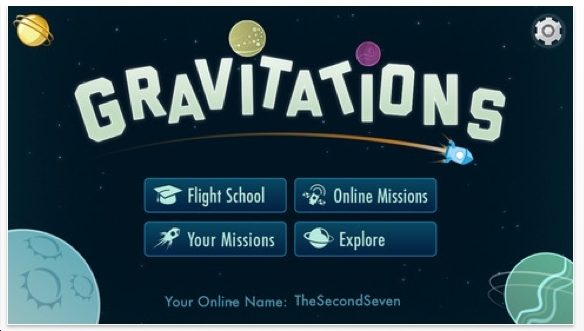 I keep planning to solve the others, instead, I gravitate to the Space mode! Stickets is a very smart, original, fun point scoring puzzle app. I'm very impressed. Update 7/10/13: I've got my high score to 308 which places me 16th on the Leaderboard out of 4000. But I know I can do better. Must make my parents proud. I feel the addiction! 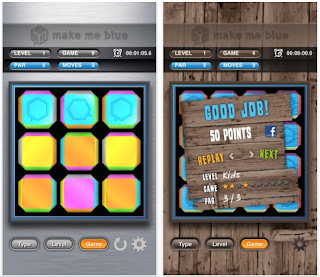 If you're like me, you've done a few dozen laser game apps. Fizzy Factory is not quite the same thing. Yes, you must connect the red fountain to the red bottle - represented by the red soda cap. There are splitters, just like in laser games. But the splitters work a little differently. 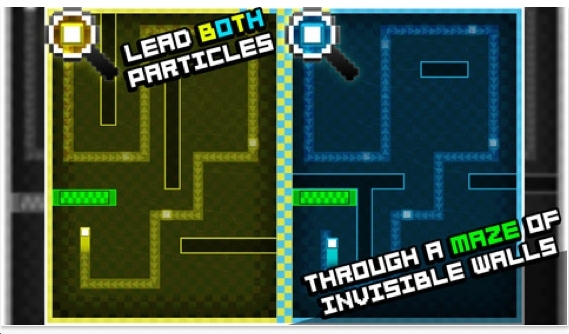 For example, if a purple goes in, a red will come out of one hole and a blue will come out the other. However, if a red goes in, red will come out of both holes. You can combine primary colors. However, mixing a red with a purple will yield brown. Brown cannot be split via the splitters into other colors. Just more brown will come out. 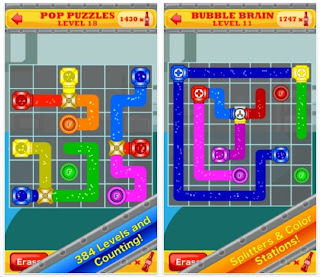 Fizzy Factory comes with about 200 free levels. I've done them all and collected 963 bottles. A lot of them are easy. Way too easy. However, I struggled on a bunch. Fortunately, you can skip around and come back to it. The bottom line: Fizzy Factory is fun!